NextGuitar Heroes: St. Vincent’s cover of The Beatles ‘Dig A Pony’. Interview with the fearless Heather Gillis. Heather Gillis is an exciting young guitarist making waves in the blues-rock Jam Band movement. She has proved herself worthy as a musician alongside some of blues-rock finest, which include the likes of The Allman Brothers Band, Col Bruce Hampton and Matt Schofield. In another life, Gillis previously co-fronted Butch Trucks and The Freight Train band, formed by the late Allman Brothers drummer Butch Truck, who incidentally discovered her in 2015. With Heather under his wing, she would grow into a fearless talent. Upon Trucks death in 2017, she was devastated and shocked, but turned her personal grief inside out and exposed its bright inner lining with a tribute to Trucks with her song Be Alright. 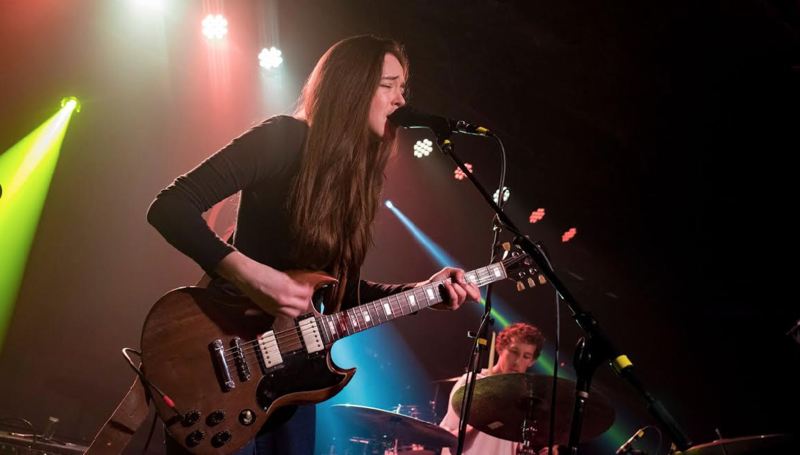 Since then, Heather has continued to mature and grow as a blues-rock and American roots musician, primarily based out of Atlanta’s burgeoning blues scene. Currently on tour with her own band The Heather Gillis Band, I managed to sneak in a request to chat with her. Here is some of what we talked about. It’s funny how inspiration can strike just like lightning. I understand you had a moment like that when you saw a movie called It Might Get Loud? After watching “It Might Get Loud” I had a new perception on music and how powerful it could be. I saw “It Might Get Loud” in the Fall of 2010. I had been playing guitar a little bit before then, but I wasn’t serious about it. I watched the DVD on a whim because it had guitars on the front. I didn’t know who Led Zeppelin was, who Jack White was, or who U2 was. After watching the documentary Jack White and Jimmy Page really resonated with me. I started digging up there music and listening to interviews about who their influences were. It took me straight to Delta Blues. Before long I was listening to Son House, Blind Willie McTell, Blind Lemon Jefferson, Mississippi John Hurt, Lightening Hopkins etc. After listening to that I realized how powerful, real and raw music can be. What is it about the guitar, blues and American roots that’s so appealing to you as a musician? I started playing guitar after a friend in middle school started. She told me she was taking guitar lessons and I thought it sounded like the coolest thing. Of course, I couldn’t start playing until she was done because that would have made me a “copy cat”. She stopped taking lessons and I picked up the guitar in 8th grade. I started really taking guitar seriously in high school. The guitar kind of fell in my lap, it was really the only option. I don’t come from a musical family. We didn’t have a piano or any other instruments, we only had a guitar. I love how easy it is to travel with and how expressive you can be with string bends. Blues and American roots music is real and raw. In its most raw form it can have the most impact. Sometimes just a guitar and vocals. Sometimes it’s just vocals and a foot stomping. It’s about telling stories, telling the truth, telling lies, stopping the listener in their tracks from the power and energy in the song. In another life, you played with the late Butch Trucks in the Freight Train Band. What were some of the things Butch taught you about being a performer? Butch taught me to be fearless. He taught me to not be afraid of the unknown in music, and to “jump off the cliff”. “Jump off the cliff” meaning, don’t be afraid to take chances and go into unknown territory with the music night to night. I had never experienced that kind of mentality before. He also taught me to stand up for myself as a musician and a female in the industry. He gave me a confidence boost I was really needing, but also pushed my every night to play something different and stretch myself as a guitarist and musician. I understand you are based in Atlanta nowadays? What is it about Atlanta’s music scene that inspires you? I have lived in Atlanta for a little over a year now. Atlanta has an amazing improv scene, that has been a real education for me. There are so many amazing musicians in the city and they gather at a couple different venues every week and do free improv. It’s not like the open jams I was used to and grew up going to. There are no “songs”, no key, no time signature, no rules. Someone starts off with an idea and everyone listens to each other and joins in, searching to create something that has never been played before and will never happen again. I get the impression you love being on the road and playing a lot of your own original music. What do you love about touring? And why? I love playing music and I love traveling. Playing on the road is the best of both worlds. We feel honored to be able to do what we do. I get the opportunity to see the country and play original music every night. It’s really a dream come true. Can you tell me a little about your touring band? Who are they? Where and when did you all meet? I started up the band again last year after I moved to Atlanta. I met all the musicians from a mutual mentor named Col Bruce Hampton. I moved to Atlanta because Hampton encouraged me to do it after graduation. When I got there he helped me put together the current band. If you had to pick just one song that you love to play live, which would it be and why? My favorite song to play live is a tune called “Be Alright”. I wrote the song after Butch Trucks passed away and I feel like it’s my homage to Butch, The Allman Brothers, The Freight Train Band and all I learned in that time frame. With songs like Fight To Win, your guitar always stands out. What’s your approach to writing your parts? I wrote the intro and guitar parts to Fight to Win the night before I wrote the lyrics. Every song is different. Sometimes I write lyrics with no music. Sometimes I write music and the lyrics come later. Sometimes they come at the same time and I’m done in 20 minutes. I feel like every song is a gift. Finally, can you tell me something surprising about yourself? I love Elvis! When I was really young I saved up all my chore money and lemonade money and bought an Elvis impersonator costume to dress up on Halloween. It was like $30. Haha, I had all the moves down, the scarfs, the lip snarl, and of course I knew every word to all the songs…. He’s the King! For tickets and more touring information click HERE. You can also connect with Heather Gillis via her Facebook page. Follow her on twitter. Listen to her on Soundcloud. Watch her on You Tube. Photo credits: All photos are courtesy of Heather Gillis and Doug Deutsch Publicity Services. I am not the uploader of You Tube clips embedded here. Love Heather and her band. She’s a force to be reckoned with, and folks should go see her — it’s true you can see Butch’s and the Col’s. influence, and it’s fabulous. Terrific, well-done article, Robert Horvat!